The restored Vulcan is currently at RAF Coningsby . The last flying Vulcan bomber (dependant on the CAA certificates) was taxied at Coningsby and stood next to our only remaining flying Lancaster. The trip from Bruntingthorpe was uneventful and successful. The two planes could be seen at the home of the Battle of Britain Memorial Flight. Both iconic British treasures of flight. XH558 flew into Coningsby yesterday following a 16-year absence from Lincolnshire, back to one of the old omber bases where the Vulcans would have flown from originally. Hundreds gathered to watch the Vulcan make the landing. The Vulcan bomber from the cold War was the last of its kind to fly from RAF Waddington in 1992. XH558 has spent recent years in Bruntingthorpe being lovingly restored. She has flown to Lincolnshire for essential testing which is required by law, before her several planned appearances at air shows. Estimates are that there could be up to 18 air shows a year for this gracious lady. Fingers are crossed for this delta lady as she performs for the officials, and we hope to see her around the country soon. The Vulcan growled again as she soared into the sky on the way to the RAF base for the final testing. As a nice gesture, Leicester’s Lord-Lieutenant Lady Gretton waved teh Vulcan on her way. Everyone must be so happy, firstly watching the beautiful delta wing shoot into the sky where she belongs, and secondly, when she returns home, she should receive her permit to fly and be ready for the air show season. Remember though, she’s still a costly lady to keep going, and until she starts displaying, she still needs alot of support. Visit the Vulcan Site and help her reach the skies again. Today is a happy day as test flights for the Vulcan bomber continue. The Vulcan Bomber will carry out several test flights during the week. It will leave its base at Bruntingthorpe and head to RAF Coningsby in Lincolnshire. A previous test flight was marred by a false alarm fire alert that forced the plane to land early. The Vulcan really does bring people together. Previously I reported that the Vulcan was witness to a marriage proposal. The latest appeal was for qualified airfield firefighters to help out for the day. The appeal resulted in at least four firefighters willing to help out at the airport for the tests. With any luck, the whole of the UK should be able to see this wonderful old ldy of the skies back where she belongs very soon. Hopefully this month will see the culmination of 11 years of hard work to restore the Vulcan Bomber XH558 back to flying condition. The final test will continue in the near future and then the display test, where the plane will undergo the display movements which it would do so at an airshow, so that the CAA can certify the plane is safe to perform. Once done the plane will be free to perform. An interesting upshoot of this comes a story from one of the sponsors of the restoration work. AD Group, a supplier of CCTV and security systems, as part of its support for the project, plan to supply a state-of-the-art FlightVu digital video recorder, and associated CCTV cameras, from its subsidiary AD Aerospace, to provide valuable in-flight footage of this historic aircraft. Now when you choose a place to propose, you pick a special place that means something to the two of you, or a place with friends and family. Well, a couple did just this the other day when they became engaged right under the nose cone of XH558, the Vulcan at Bruntingthorpe. The couple travelled from Hove to visit the Vulcan when Martin Gearing, went down on one knee and proposed. The TVOC, the company formed to restore the Vulcan to flight, were happy that a club member had chosen the location and in front of the Vulcan and wish the couple well. 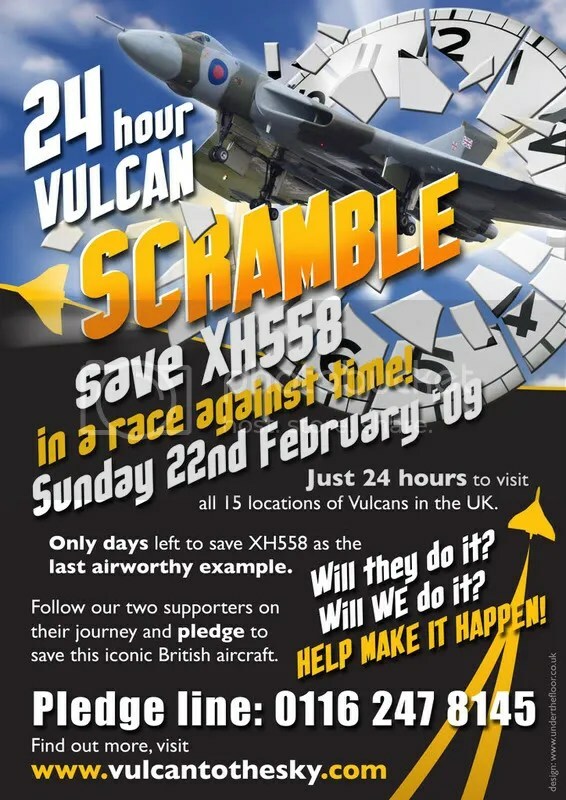 They have also invited them to the first airshow that XH558 will display at once all testing and funds have been arranged. I would like to pass on congratulations to Martin Gearing and Sarah Britten on their engagement.